Ma Barker and son Fred Barker put on a showdown that would have made Clint Eastwood proud and helped to solidify her unwarranted fame as a gang leader. There are a number of dates put forth for her birthday but no doubt when she died. As for her birth, it appears to be around 1872 or 73. Ma was born Arizona Donnie Clark outside of Ash Grove, Springfield, Missouri. She married George Elias Barker in 1892 and had four sons who became criminals at an early age. Sons Herman, Lloyd, Arthur (or Doc) and Fred moved to Webb City with their parents and became small time criminals while their mother tried to keep them out of jail as much as possible. (According to jayssouth.com, Ma began calling herself Kate). Later, living in Oklahoma, the Barker boys became members of the Central Park Gang and a life of crime that brought them eventually to the big time of public enemies such as Dillinger and Bonnie and Clyde. The Barker boys robbed and killed in crime sprees across the country with the Karpis-Barker gang and now the FBI was on their tracks. Ma Barker lived with the gang but never took part in a crime or killed anyone although many believed that she planned their crimes. 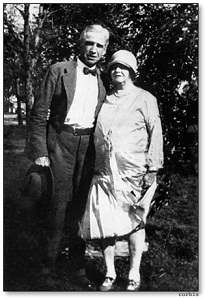 In January of 1935 Fred and his mother decided to find a quiet hideaway in Florida for awhile. 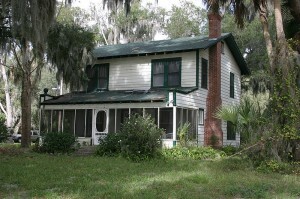 They chose a two-story house on Lake Weir, near the town of Ocklawaha. Posing as a couple, neighbors said they stayed to themselves but had visitors with nice cars. Fred let it be known to others in the gang that he and Ma were heading to a lake to hunt and kill a large well-known alligator, Old Joe, living in the lake. Later, gang member Byron Bolton was captured by the FBI and told them Fred’s location, mentioning “that maybe Freddie had gone there to try to kill Old Joe.” They also had a map of the lake in the Ocala area with the arrest of Doc Barker. On January 16, 1935, FBI agents assembled and “a small army of federal agents surrounded a house on Lake Weir, Florida. They called out for the occupants to surrender.” (jes-group.com) One source had Ma Barker opening the door, followed by Fred, who then opened up with a machine gun. Quickly back inside, a shootout flared on for some 5 hours. Another source said “A call for their surrender was met with no response. After a few moments, Agent Earl Connelly of Cincinnatti yelled, ‘Unless you come on out, we’re going to start shooting!’ “Ma replied, ‘Go ahead.’ (jayssouth.com) They did and it turned into the longest gun battle in FBI history. Reports were that 1500 rounds were fired but another tally showed a number of guns inside and a large sum of money plus 3500 bullets fired into the house. After the firing stopped, the handyman and cook for the Barkers was volunteered to go in the house and see if anyone was still alive. He found Fred and Ma Barker upstairs , just feet apart. “Fred had 14 bullets in him. Nearby lay Ma, dead of a single gunshot wound, which may or may not have been self-inflicted, or fired by Fred when capture seemed imminent.” (jcs-group.com) Click on image. 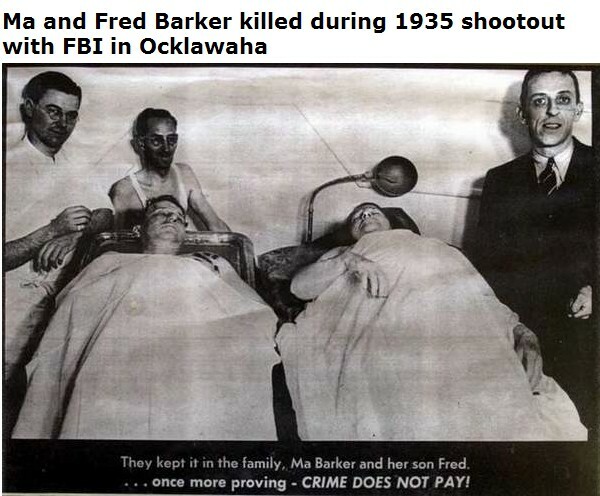 Despite J. Edgar Hoover’s efforts to show that Ma Barker took part in the gunfight there was no evidence that she had ever committed a crime or killed anyone or planned any crimes. She had merely traveled with the gang and enjoyed the fruits of those crimes, which would have her in prison for a little while. Her exploits were nothing more than the public’s imagination running wild. For another look, close up, check out this article from Ocala, Florida (2003) where they have been known to have a reenactment of the gunfight on occasion.